The knee is the largest and most complex joint in the body, and although it is a hinge joint, it can also turn and glide a little. As such, it is an elaborate joint that is put under great pressure with every movement. It therefore comes as no surprise that wear and tear in the knee is one of the most common forms of arthritis. Specialists call knee osteoarthritis, which mainly affects people over the age of 50, ‘gonarthrosis’. The knee is a hinge joint that connects the shin with the femur. The bone endings are covered with a layer of cartilage. This elastic tissue ensures that the bones slide over one another smoothly. Moreover, it absorbs shocks while walking, running, jumping and during other demanding movements. The meniscus is a loose piece of cartilage on the outside and inside of the knee which spreads the pressure on the thigh and shin across a larger surface. The anterior cruciate ligament in the centre of the knee joint prevents the lower leg from shooting forward while walking and making rotating movements. The kneecap is located at the front of the joint. This thick, triangular bone stabilises the hinge function of the joint and has an inhibitory and protective role. Just as with other forms of osteoarthritis this condition affects the quality of the cartilage. This causes the tissue to wear, a natural phenomenon that gradually occurs starting from the age of fifty. Knee osteoarthritis can also occur at a younger age, e.g. due to fractures, ligament injuries or a tear in the meniscus. Symptoms can also occur years after having sustained an injury. Loose flakes of cartilage in the joints can cause inflammation, which eventually further damages the cartilage. It can take years for you to start feeling chronic arthritis pain following such an incident. 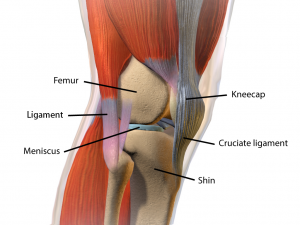 Rheumatoid arthritis is another condition that can affect the knee cartilage. This disease differs from osteoarthritis in terms of causes and characteristics, and it has a different course. However, it also causes inflammation, which damages the cartilage, resulting in (secondary) osteoarthritis. Arthritis of the knee is characterised by wear and tear to the cartilage layer between the bones, which causes them to touch. This results in pain, usually in the knee and the hollow of the knee, radiating to the legs. The pain tends to increase after walking, going up and down stairs or kneeling. Stiffness is another symptom, which is mainly felt after a period of rest, for example when getting out of bed, or when getting up from a sitting position. The knee then feels as if it needs some time to ‘start up’. Fluid build-up can make it difficult to bend and stretch the knees. In more advanced cases, the joint can even change shape due to bone spurs or ‘osteophytes’– outgrowths of bone along the sides of the joint – which aim to better distribute the pressure on the joint by increasing its surface. The knee joint can also suddenly block, which is called ‘locked knee’. If you feel stiff and swollen, and have continuous, nagging pain after straining the joint (so not only during an activity), it is most probably inflamed, as these are symptoms of inflammation. People often think osteoarthritis does not cause inflammation. That can be true, but only if you experience pain during straining (when the bones touch each other) and have no other symptoms apart from the joint cracking and blocking, and possibly outgrowths of bone along the sides of the joint. As explained earlier, loose flakes of cartilage in the joints cause inflammation. In most cases, this is what causes pain in arthritis patients. How is arthritis of the knee diagnosed? First of all, you need to visit your GP. In case of advanced and serious arthritis of the knee, you will be referred to an orthopaedic surgeon. This specialist will ask you about your medical history – which medication are you on, have you had knee injuries in the past etc.? You will also need to tell the surgeon when the pain started, whether it affects one or both knees, whether it increases when you bend your knees and whether you are also in pain at night. A physical examination will follow to assess how you walk, how you move your knee and whether there is any swelling in the joint. Finally, an X-ray can confirm the diagnosis. 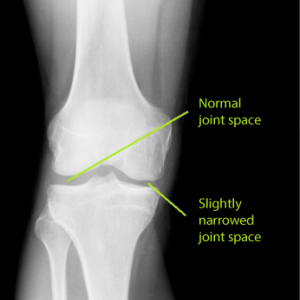 If the joint space, which is clearly visible on an X-ray, appears narrower, you suffer from osteoarthritis. In fact, the X-ray shows how the endings of the shin and the femur have moved closer together due to the thinning cartilage. Any bone spurs along the sides of the joint are also clearly visible. Subsequently, a blood test can be carried out to exclude rheumatoid arthritis. This knee does not show significant lesions: the joint space is clearly visible across the entire width, but on one side, it is narrowing slightly. The thinning of the cartilage is irreversible. Therefore, the only treatment method for osteoarthritis is to keep the remaining cartilage as healthy as possible. This can be done by moving at least half an hour a day, for example by walking or cycling. Rest is bad for the cartilage. When the joint is strained, the cartilage is pressed together, so that toxins can be removed. Once pressure is relieved, this tissue soaks up nutrients like a sponge, preserving the remaining cartilage. This process also inhibits inflammation in the cartilage. Consequently, all specialists will tell you that you need to keep moving if you suffer from osteoarthritis of the knee. Another common piece of advice is to combat obesity. With arthritis of the knee, more than with osteoarthritis of a non-load bearing joint, such as the hand, it is more important than ever to keep your weight under control. When walking, you often rest on one leg, meaning all your body weight rests on the other knee joint. If this joint is affected by osteoarthritis, every kilogramme of weight lost is a plus. The specialist can also refer you to a physiotherapist, who will try to limit the effects of your osteoarthritis of the knee, so that it affects your daily life as little as possible. 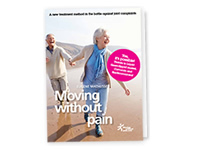 The physiotherapist can also teach you exercises to keep your joint in good shape or he can show you how to make certain movements differently to reduce the strain on the joint affected by arthritis, and on yourself of course. If you are in a lot of pain, the specialist will try to fight the infection with non-steroidal anti-inflammatory drugs (NSAIDs). If these do not work (anymore), you may be prescribed corticosteroids, such as prednisone. Since this medication can have nasty side effects, many patients are keen to stop taking them after a while. NSAIDs can cause gastrointestinal problems, and even bleeding (particularly in combination with cardiovascular medication). Corticosteroids cause hormone fluctuations, which can lead to fluid build-up fairly quickly. Even stronger, morphine-like medication, has a dozing and even addictive effect. If you’re still full of life, you obviously want to avoid this, no matter how bad the pain gets. Paracetamol is a lot milder, and therefore it is the painkiller of choice. Unfortunately, paracetamol does not sufficiently reduce the pain for everyone. 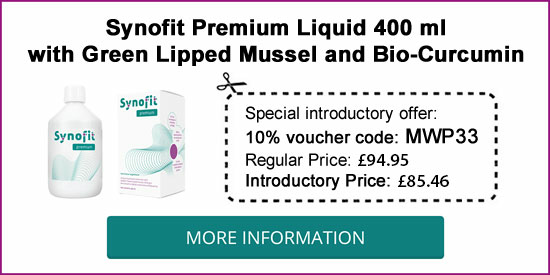 A liquid supplement based on Green-lipped mussel and Curcumin is a valid alternative to reduce the inflammation and the pain without side effects. These natural anti-inflammatories take an average of five weeks to achieve virtually the same effects as NSAIDs and rarely have side effects. Keen to try this natural alternative? Then head to your pharmacist, drug store or health shop and ask for this liquid supplement. In case of extremely severe symptoms, which significantly affect your daily life, surgery can be considered, and in some cases it is even inevitable. There are also new developments in the field of stem-cell therapy. In this framework, a study is currently being conducted in the Dutch city of Nijmegen, involving 150 patients affected by arthritis of the knee who are undergoing stem-cell therapy. The results of this experimental research have not yet been published, but we follow this with interest. Below you will find an exercise programme that aims to promote knee mobility. You should do three sets of each exercise, with a 30-second break after each set. Good luck! Lie on the floor with your legs stretched. Slide one foot over the floor towards you. Count to three and release. Move your foot back to the starting position and repeat with the other foot. Sit on the floor, leaning on your hands, which you place slightly backward. Bend one leg. Push the hollow of the knee of your stretched leg against the floor and pull the bent leg towards you slightly. Count to three and repeat with the other leg. Stand upright. Take a big step forward and bend your knee. Rest on your front leg and keep your knee above your foot as long as possible. Repeat with the other leg. Do this exercise with moderation! Sit on the edge of a sturdy table and leave your legs dangling. Stretch one leg as far as possible. Hold for a little while and repeat with your other leg. This is the perfect way to end your exercise session. Sit on the edge of a sturdy table and leave your legs dangling. Swing your legs back and forth at a relaxed pace for one minute.